Click Here to read part 1 where I outline some of the problems I see Aquatics Directors facing. Now, for part 2…some ideas on solutions or how we can address these issues. I’d like to give a disclaimer saying I don’t have all the answers but wanted to share what has worked from my experience and some ideas from fellow colleagues and other non-aquatics operations. I do understand, and I’ve been there myself, that there may be operations and superiors that you may not be able to work with, and that is okay too. That is the nice thing about most of our employment positions being “at-will”, so if it isn’t working or your values are not aligned you have the ability to look elsewhere. So often, issues of conflict arise during a critical moment, a staff meeting in front of a bunch of people, a budget meeting with ownership or executives, and I think timing just escalates things to a negative response. If you know there is going to be a concern with XYZ, try to schedule a time with your Superior before the critical moment to discuss the options. Taking a pro-active approach allows your Superior to not have to ask “uneducated” questions or make decisions in front of people. Try to put yourself in your Superior’s shoes….they are trying to lead an organization or a department, make good decisions, act as a liaison, and look smart and put together in meetings. How they handle issues during these meetings may be completely different than in a one-on-one meeting. There is a chance they will appreciate your pro-active approach and be more willing to listen to your options and opinions. I remember scheduling a meeting with a new Superior one time after we had a staff meeting that was more contentious that I liked. I walked into her office and after chit-chat, I told her that I was committed to her vision for the department, I wanted our team to be successful, and I understood what a hard spot she was in with her decision making. My ultimate goal was to find common ground and to have her see me as an ally instead of someone for her to battle. I think once she verbally heard my intentions were aligned with hers, our battles significantly reduced. Most of us do the best we can with the best we know. I don’t think people purposely try to make bad decisions or make unrealistic requests to us, but you can only make decisions based on what you know. As I mentioned in Part 1 of this series, a lot of times Aquatics Directors report to someone with no aquatics director experience, or maybe they were a lifeguard once in their former life. We find ourselves reporting to executives with backgrounds in finance, fitness, risk, food & beverage, recreation, rides, marketing, government, or pretty much any area outside of aquatics. I believe one of the quickest ways to create a believer out of your superior is to educate. I think of this as “coaching up”. Invite them on a tour, review your injury incidents and the specifics of what happens, educate on local drowning events or similar operations, review codes and lifeguard provider requirements, show them audit footage, invite them to participate in a zone certification, invite them to sit in on a lifeguard training. This educational piece takes a lot of work, but I found that when I really wanted to roll my eyes at something my uneducated superior said, it would have been more productive for me to think about how I can educate them more. When we know better, we do better….and we lessen the dumb requests and ideas. In today’s day and age, Aquatics Directors have been placed under scrutiny for their decisions related to safety. This is the type of decisions an Aquatics Director should ever have to face and I challenge you to know your ALoS (Acceptable Level of Safety) and to not compromise in your standards. We have now seen how your decisions may need to be justified if something doesn’t go right. As not fun as it is to say, protect yourself. If you are asked by Superiors to do something that will compromise safety, protect yourself and find a new place to work. If you knowing are operating in an unsafe manner, there is nothing you can say to justify this decision. When I found myself in a position where I felt the need to save emails and CYA, I knew it was time to look elsewhere. Stick to your convictions and protect yourself. It may feel like you are dealing with a playground bully, but unfortunately, you may need to draw your line in the sand and protect yourself. This goes for both you as an employee and your operation: Know your value. If you are as passionate and as focused as a leader as I think you are, you have a huge value to not only your organization but to our aquatics industry. Your organization also has tremendous value that can sometimes be overlooked. Get your statistician on. Know the value you bring. How many people do you employ, what are your participation / attendance numbers, what are the number of rescues, what is your % of drop drill success rates, what value do you bring to the community, how do you increase the value of the area, what educational programs do you run or partner with, how many first aid injuries do you tend to, how many smiles do you create, how many swim lessons do you run, how many campers do you keep safe, how many riders do you keep safe on your ride….know your stuff! I used to keep these type of stats on the inside of my notebook that I brought to meetings. I can’t tell you how often I was able to reference one of them and sound brilliant! Find some statistics to track and know your value! What drives you to keep going when it is really tough? What is the most important part of this journey? What can I learn here that would help me in the future? Where can I turn for mentorship/advice? Find someone who can honestly mentor you. Preferably someone outside of your organization. There is something amazing about being able to share with someone and then asking if you are crazy or if your feelings are validated. Being able to see an outside perspective and have someone to challenge you can always help you stay connected to who you are and who you want to become. These conversations are invaluable and can help you stay sane. My former employee texted me “Hey Natalie, can we meet for lunch…I need one of your pep talks and need to catch up”, I’m always game for taking time out to help someone who is genuinely interested in their development. I think we all need to be heard and connected with someone we trust. It is an honor to be that person for someone. 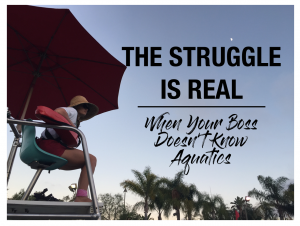 I hope these 7 tips can help address some of the frustrations that most of us have faced in our aquatics journey, and I see far too often when visiting aquatic facilities. I think we need to do a better job as a community of supporting one another so we don’t lose more passionate aquatics professionals. Hopefully, these thoughts are one small step. Let me know your thoughts!